Amy's Gourmet Apples takes extra fancy JUMBO Granny Smith apples (firm & slightly tart) and dunks them into a vat of homemade buttery caramel. Then they are dunked into our world-class Belgian chocolate in either milk, dark or white chocolate. The Belgian Chocolate drizzle will vary. The toppings cover the entire apple all the way up to the stick. Set of two in your choice of milk, dark, white, or double-dunked Belgian Chocolate. Each incredible apple comes packaged in a copper embossed gift box. Featured on the Food Network "Roker on the Road" and proud recipient of the Wisconsin State Fair Blue Ribbon Seal of Excellence. All natural and no preservatives. Shelf life is at least 1 week or up to 2 weeks refrigerated. We suggest you eat the apple slightly chilled for best flavor. Each apple serves up to 6 people. 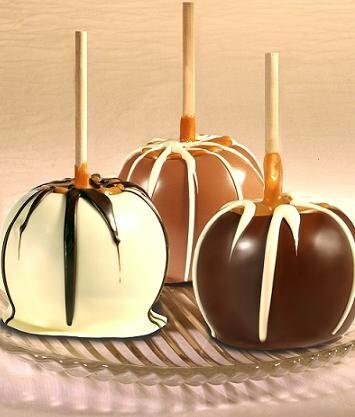 To ensure the freshest apples and confections possible, your order is made just for you (not taken off of a shelf). Expedited shipping required. Ships Monday, Tuesday, Wednesday only. Featured on the Food Network "Roker on the Road"